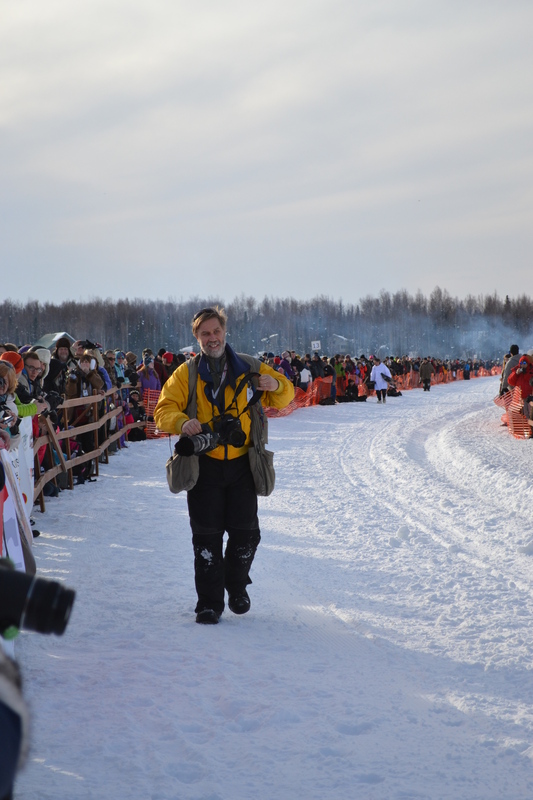 The dedicated staff of the Iditarod makes sure the race happens successfully each year. Their work behind the scenes is what makes the spectacle come alive for fans around the world. I knew this was not going to be good. I was doing 25mph or so on the snow-go on a good well snow-packed trail trying to get back to the village of Unalakleet before it got too dark. I saw the trail ahead of me was glare ice and recalled how hard it was to steer and gain traction on that trail only an hour earlier. My brain instantly thought of the worse-case scenario that could happen if that fast-moving machine were to get onto the glare ice in any wrong sort of way. I had borrowed the snowmachine for a few hours from Stanton Panupchuk in Unalakleet in 1999. As always, it was my custom to want to get out on the trail away from the checkpoints to get mushers in the real action. This was one of those times. I followed and passed a couple mushers out of Unalakleet and up into the hills. Got some very nice, out of the ordinary trail images. But doing 25mph on glare ice, my brain told me that at some point the snowmachine track would spin and there could be trouble. Having not been in this predicament before I figured I needed to simply let up on the gas, hold the steering straight and glide to a more manageable speed or stop. That worked out pretty well until the machine started to spin slightly, and then slightly more and more until it was going side ways. “Well, maybe it’ll spin around and I’ll end up backwards,” I thought. “Or maybe when it’s perpendicular to the trail and line of travel, it will catch on a frozen in rock and flip the machine with me on it.” Sure enough, the sled cart wheeled side-ways, came right over the top of me in one of those slow-motion, surreal-type movies, clearing my body by a couple inches. Thankfully I had on my fur hat which kept my head from cracking on the ice. The machine landed right-side up, my camera bag still strapped on, and the only breakage on the machine was the windshield. I was very blessed that night. I brought the machine back to the checkpoint where Stanton was and told him what happened and gave him an extra $100 for the broken windshield.